These case studies are real world examples of our services in action. In order to protect client confidentiality certain information has been withheld. Issue: There was a general consensus that the production crews were abusing their power over the engineering crews. As a result the engineering crews were not contributing to their full potential, as they were unmotivated and unable to properly collaborate with other sectors. The workshops provided a supportive environment in which the crews were able to develop an understanding of the situation. Once realisations regarding the severity of the problems had been made, all employees involved were immediately motivated to contribute to developing solutions. The solutions implemented included developing Performance Contracts, implementing new dispute resolution systems, and creating pairs of employees (one from each department) who were responsible for keeping the channels of communication open. 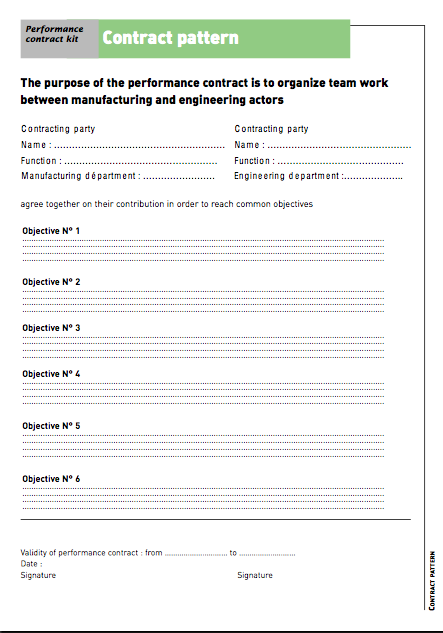 Creating the Performance Contracts involved the crews selecting common objectives, negotiating their individual contributions to those objectives and turning them into written documents. All employees in subsequent workshops then completed these Performance Contracts and signed them. Following the implementation of this Cross-Functional training in the first factory (which involved over a thousand employees) a movie was made detailing the success of the program. This movie was then presented to the other European factories of the group. Subsequently the Performance Contracts were then implemented in every one of these factories. This has not only improved the company’s results but also the general well being of its employees. Issue: Our client was suffering losses due to strikes. The disputes had been persisting for years and court appearances had become commonplace. Our brief was to reduce the number of strikes. The intention was to initiate these groups working together effectively to unravel the issues that were causing the strikes. It was discovered that major driving forces behind the disputes included a lack of trust in the leadership of the company, an uncertainty amongst employees in regards to their job security, and a complicated system for employees to file complaints meaning that they felt their grievances were not being heard. Following the findings of these preliminary workshops we realised that the only solution would be to hold a workshop with both union officials and senior executives. This proposition was met with such a high degree of skepticism that there was difficulty in even convincing people to attend. However, the workshop went ahead and was an extraordinary success. The participants worked together all day and managed to agree upon common objectives and action plans. At the end of the workshop many individuals confessed that they hadn’t expected it to last more than half an hour, and one IR expert said that the result was a miracle. At the end of the entire process we came up with a new dispute settling system including a new process to follow. We also developed training that encouraged negotiation and discussion of issues before turning to the formal dispute resolution system. We included over sixty people in the development of these solutions. It was the involvement of employees from all levels that was the key to our success. We equipped senior managers with the skills and knowledge necessary to make this new system a reality. They then proceeded to pass this down until it was completely entrenched at every level of the business (over 4000 people). The impact was immensely beneficial to the company as it significantly reduced the number of strikes. This created a more harmonious working environment and improved the wellbeing of employees. The CEO of a manufacturing company decided to invest in our Creative Visioning services. With the CEO and his direct reports we work-shopped to develop an inspiring dream for the future direction of their company. This dream involved entering entirely new markets and selling their products directly to the public as well as to other customers. Following on from this we undertook strategic analysis to determine which parts of the dream were viable and how they should approach achieving them. As a result they entered into three new markets, successfully marketed themselves to the public and increased their revenue by 42% over two years with an EBITDA of 20%. Issue: The closure of one of the business units of a large multi-national organisation had been announced. They were experiencing serious financial issues, and these issues were compounded by a lack of care and response amongst the leadership team. In a last minute attempt to save the site, the GM requested our help in motivating the team into turning these expectations around. Through creative work-shopping activities we encouraged the employees to realise how the closure was going to impact them. We then addressed, as a group, how to reverse the culture of passivity that was driving the business to failure. This process was taxing and confronting for all involved. It was, however, the unanimous verdict that they were going to fight to save the site. Following on from this, they used our Creative Visioning service to come up with a vision for the future of the site, creating a sense of hope and momentum. They presented their strategy to upper management and were granted an additional trial period of one year to continue operations. In this year, using our Strategy Deployment service, they exceeded their profit expectations and are currently still in operation. Issue: Our client was experiencing very deep-seated issues in their workplace culture. The former CEO had been excessively authoritative, and employee mistakes were severely punished. The result was a constant sense of anxiety that hindered innovation and creativity. The new CEO knew that things had to change in order for them to achieve their challenging targets. We began by hosting workshops in which employees from all levels were invited to brainstorm their ideas on what they considered to be good leadership. We then collected the results and found that popular opinion within the company considered that qualities of a good leader include being supportive, available, trusting, rewarding, receptive to new ideas, and knowing how to delegate effectively. Our challenge was then to work out how to encourage managers to adopt this style of leadership, and also how to communicate to all employees that these changes were being implemented. These initial workshops were in fact the first step towards in the right direction. They embodied the more inclusive and flexible approach to leadership that the CEO wanted to introduce. We then carried out extensive training sessions, largely based on role-playing, to help managers develop new leadership skills where necessary. Following the implementation of our program employee stress levels were significantly reduced. A rise in creativity and innovation occurred and results followed, leading to 30% profitable growth.